Beautiful, Beautiful Zion The town of Springdale, Utah rests in the shadows of Zion National Park where massive sandstone cliffs soar into the blue skies. Early Mormon settlers called these majestic stone canyons the “Natural Temples of God”. Mormon influence can still be felt throughout the park as they named several of the rock formations. A great place to begin the day is to stop at Zion Canyon Theater and watch Treasure of the Gods, an IMAX film. Here you receive a great overview of the park and can then select some of those places you really must visit. The film gives spectacular views of the canyon from an airplane flying over, as well as going deep within. Spectators feel they are actually viewing the canyon seated in that plane. Much centers around the Indian legacy from the 1500’s, as you experience the myth and magic of the canyon. Ancient native people called this rugged landscape home, for centuries. 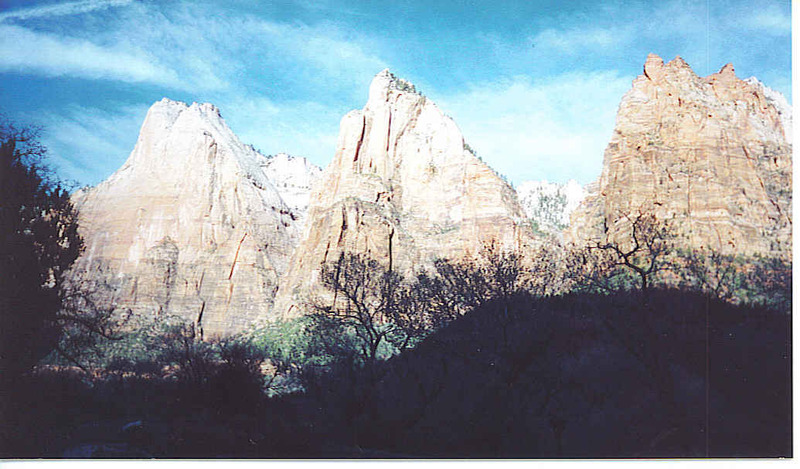 There are two scenic drives here: the Zion Canyon Scenic Drive and the Zion Mount Carmel Highway. 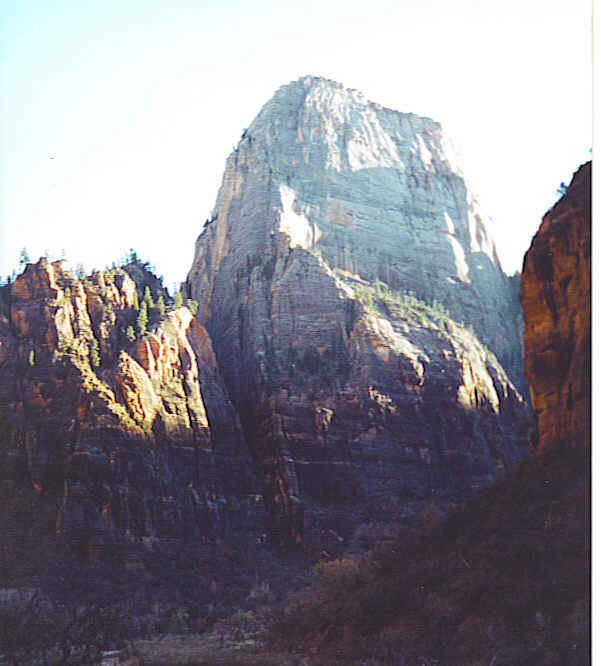 This trip we are exploring along the Zion Canyon Scenic Drive, which is a favorite route. In fact, it is so popular that now during the summer months, this road into the park is closed to regular traffic, making access to the park’s scenic beauties available only through shuttle bus service from April 1 – October 31. However, during the winter months vehicle traffic is permitted making it much more fun to explore at your leisure.The Zion Mount Carmel Highway is open to traffic all through the year. The Three Patriarchs are a trio of very similar mountain peaks called Abraham, Isaac, and Jacob. All of them are nearly 7000′ high so can be seen from many different parts of the park. One of the shuttle’s first stops has a path that leads up a short incline for easy viewing. The Emerald Pool is nearby and has several small waterfalls that add to the beauty of the surroundings. Cliffs on both sides of the road are a half mile high and end at the beautiful Temple of Sinawava, home of the Paiute Indians’ coyote spirit. 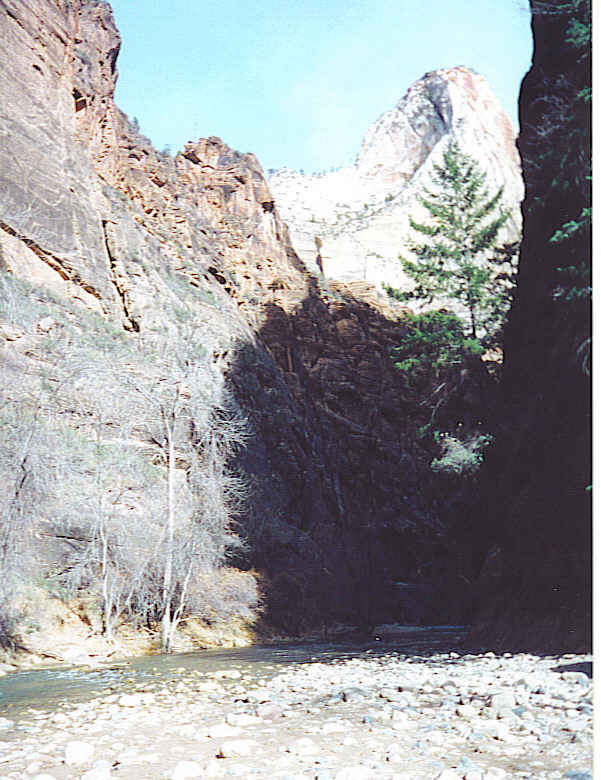 Here the Virgin River travels a narrow path between the mammoth rocks. This is the perfect time to park your car, or get off the shuttle, and walk along the riverbank. This two-mile round trip Riverside Walk meanders all the way to the end of the trail, The Narrows. To continue, you must wade, walk or sometimes swim in the river. Peeking through at the end of The Narrows you can catch a glimpse of the Temple of Sinawava. 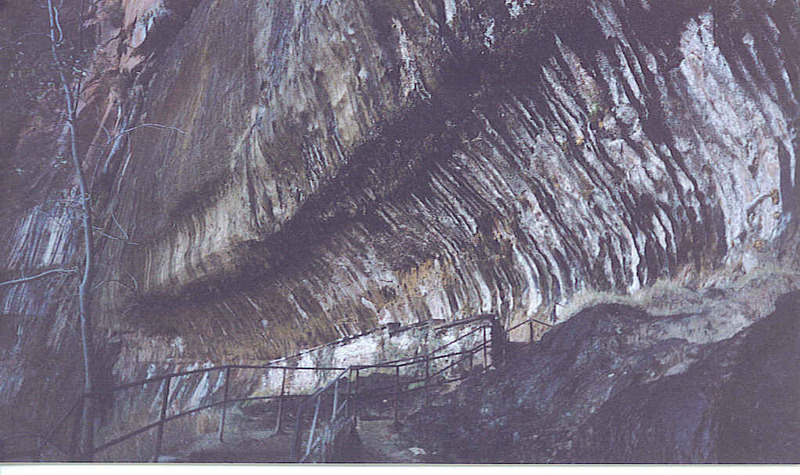 Another steep path leads to Weeping Rock where a veil of spring water seeps through the sandstone wall making it appear that the rock is crying. The steps culminate at a large eroded area with slippery floor from the tears and growing moss. Often there are hanging flowers enjoying a drink from the rocks as well. A gentle trickle of water flows through the rocks in the fall, but in the winter icicles often form. A guide remarked that this water should be quite pure as it is filtered through the sandstone rocks from the rim of the canyon on an incredible journey that takes from one thousand to four thousand years. The Great White Throne, a highlight of Zion National Park, seems to glow in the evening light as it overlooks much of Zion Canyon. It stands out easily, even in the daytime, with a beautiful red rock background. Made of white Navajo Sandstone, the top appears glowing white while the base is red. This received its name from the Mormons, who felt this area represented the New Jerusalem, and called it The Great White Throne, a name appearing in Revelations as the seat of God for the last judgment. Spending the evening in a small motel in Springdale was also quite a treat as it was necessary to patiently wait in the car for the elk to decide to move out of your way. They were very friendly and not the least bit afraid of cars or people. The elk enjoyed rubbing their antlers on the trees in the parking lot…and sometimes attempted using the parked cars. This was one of those times when you could easily “reach out and touch someone’…an elk if you dared! To visit Zion National Park from the North on I-15, exit on Hwy 20. Follow US-89 to Mount Carmel Junction where you will meet SR-9, which is the Zion-Mt Carmel Highway and is always open to vehicle traffic. From the South on I-15, exit 16 will take you through Hurricane and LaVerkin. 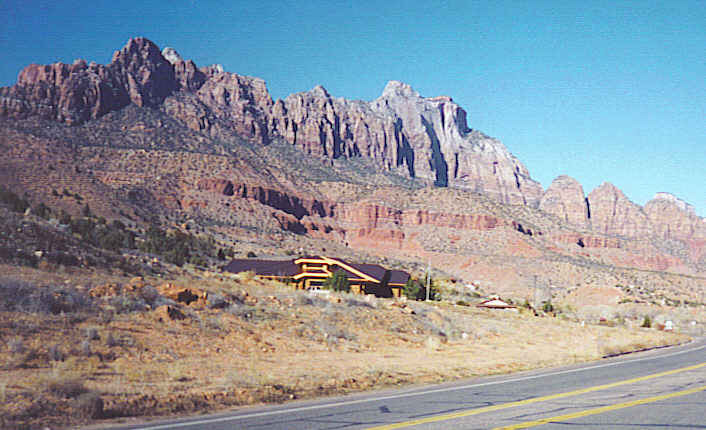 Again you will take SR-9 to the entrance of Zion National Park. Got to Natural Bridges, Arches and Canyonlands, but never Zion. Looks amazing! Utah is one of my favorite places in the US, mainly because of their beautiful and unusual rock formations. A walk among the beautiful creations of Mother Nature here is very peaceful for me. Our world is filled with beautiful spots for us all to enjoy. Thanks for taking a Gypsy Road Trip.